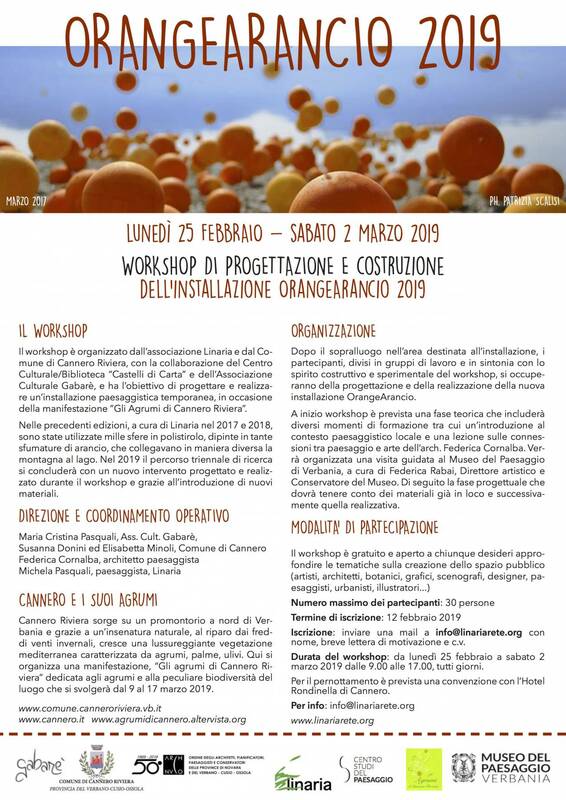 WORKSHOP GRATUITO PER LA PROGETTAZIONE E REALIZZAZIONE DI UN'ISTALLAZIONE PAESAGGISTICA TEMPORANEA, IN OCCASIONE DELLA MANIFESTAZIONE 'GLI AGRUMI DI CANNERO RIVIERA' - ED. 2019 - DIVERSI MOMENTI DI FORMAZIONE TRA CUI UN'INTRODUZIONE AL CONTESTO PAESAGGISTICO LOCALE E UNA LEZIONE SULLE CONNESSIONI TRA PAESAGGIO E ARTE. A SEGUIRE VISITA GUIDATA AL MUSEO DEL PAESAGGIO DI VERBANIA.